In a small bowl, thoroughly stir together flour, cornstarch, baking soda and cream of tartar. Using an electric mixer, beat the butter and both sugars until creamy. Gradually beat in the oil; beat in the egg and vanilla until smooth. Add some butter flavoring if you like. Gradually stir flour mixture into butter mixture. Batter should be too soft to roll -- it's similar to chocolate chip cookie dough in thickness. Chill the dough for about 30 minutes so that it's easier to shape into balls. When ready to bake, scoop up scant tablespoons of dough and shape into 1 inch balls. Arrange the balls about 2 inches apart on ungreased or parchment or foil lined (do not grease or use spray) baking sheets and bake for 8 to 10 minutes. Let cool slightly on baking sheets, then transfer to a rack to cool completely. To make the frosting, put the room temperature butter in a bowl. Gradually add as much sugar as you can, stirring well, then add a little milk. Start beating with an electric mixer and continue adding sugar and milk until frosting is creamy. Add vanilla. They tend to be puffier, lighter and crumblier when bleached flour is used, but you can use any flour you like. 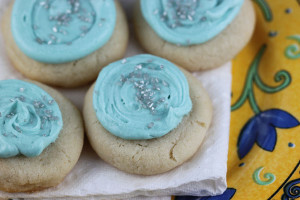 As for the frosting, this recipe only uses 1/2 cup of butter and the rest of the moisture comes from milk. Whole milk works the best. With a higher ratio of sugar, the frosting crusts over. However, if you want a richer frosting you can use 1 cup (2 sticks) of butter. The yield is approximate.